In this society, more and more people are aware of importance of environmental protection. Energy-saving, resource-recycling and low carbon development have become developing standards of each enterprise. Shunky actively response to this call and promise to develop in the direction of safety, environmental protection. The new 6S sand maker produced by Shanghai Shunky Manufacture can save at 60% energy compared with older generation, and there are an average of 70% of parts can be reused, which can save 80% manufacturing costs, and the price of this new machine is 80% to 90% of the older one. Actually, the cost is less than 50% of the original. The data above is strong confirmation that Shunky has walked in the forefront of energy saving and emission reduction. Shanghai Shunky technicians has continuously done research and development. Its sand making machine changes traditional allocation and consumption of quick-wear parts greatly reduced, thus cost of investment has been greatly saved. 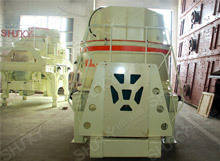 It is worth mentioned that Shanghai Shunky 6S new sand making machine not only has high production efficiency but also has high degree of intelligent, it ables crusher ore to required size once, which reduces the cumbersome process of crushing and improves productivity of sand maker manufacturers, thus they can gain huge market profits.